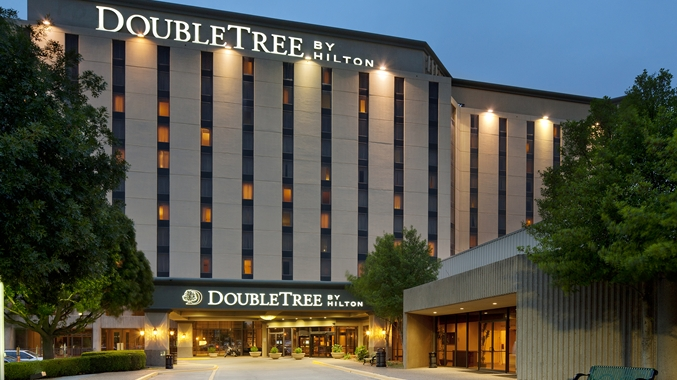 Double Tree is one of many hotel brands owned by Hilton Worldwide. Of the 450 Double Tree hotels and resorts, some are franchise owned and some owned by Hilton World Wide. To reach guest services call 1-800-560-7753. To write a letter to Hilton CEO, Christopher Nassetta, address your envelop with: 7930 Jones Branch Drive, Suite 1100, McLean, VA 22102. The corporate phone number is 703-883-1000. Find contact information here and find customer support here. 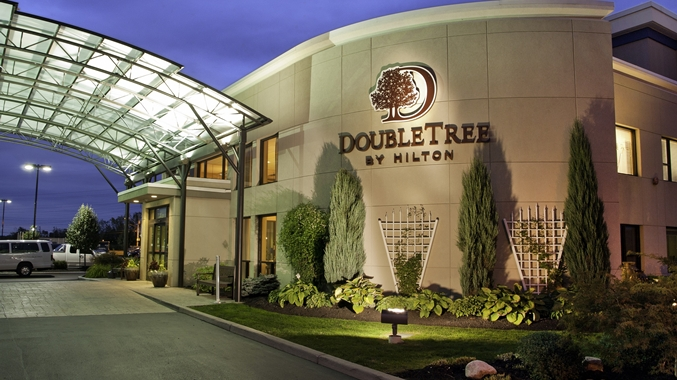 Warm, comfortable, friendly and true upscale, the Double Tree hotels are for business, family and are pet friendly. You are greeted with a Signature Cookie Welcome and also will find fitness centers. Social presence is on Facebook, Twitter, Instagram, YouTube and LinkedIn. Is this correct? I am Marine combat veteran. I am also a disabled veteran. I did not fight for my adopted country as did my grandfather, my father, uncles, my brother, my sister, and my son to see this crap. We are all US citizens. We love this country and have lost to many friends in the service of this country. I can tell you that I will continue to pass it on. My name is Brandon Guilbeau and I work for GPS Hospitality!! My company uses the Lafayette Louisiana branch for quarterly meetings!! This place is used as a common meeting place since the group is use to meeting at this location ! I was informed by my supervisor that we would be meeting at this location and had spoke with hotel and it was ok for us to park for this one night! Well to make a long story short I was towed and the hotel property is trying to weasel its way out of being responsible!! Also found out the hotel managers and the tow company owners are friends!! This branch has been a nightmare to deal with! 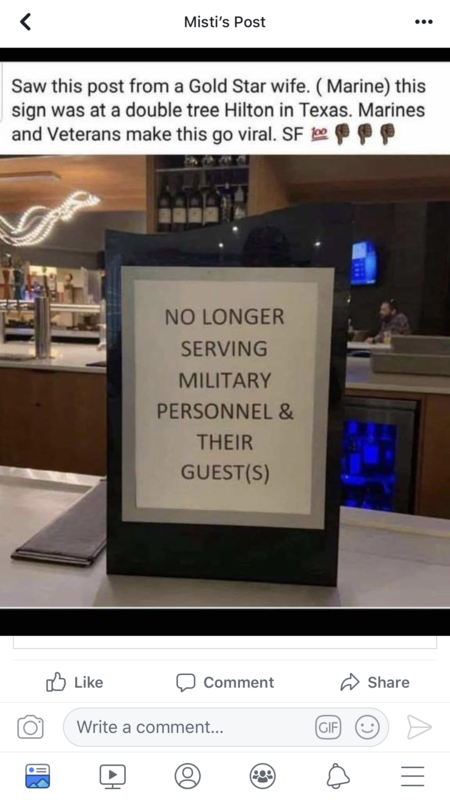 As a 22 year combat veteran in the USAF, I feel it is an absolute disgrace that your Colora9 Springs location has refused service to Military personnel. You have no earthly clue what these people go through to ensure your freedoms. We dont want praise or recognition. We just don't want to be tested like outcasts. It is despicable what has transpired there. I promise you, it is now my personal mission to destroy your company's reputation. I hope you're prepared to deal with the fallout. Good luck. This was on Fox news today. 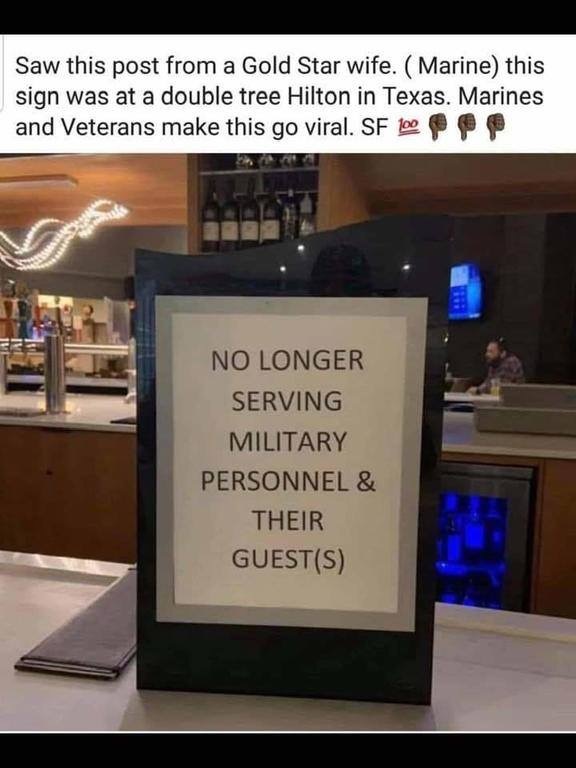 Bar placed a sign to refuse service to Vets at the Colorado DoubleTree. Disgraceful!!! “So last night we took over 600 people to the DoubleTree Colorado Springs and paid over $50 a person,” Osbourne wrote on the Facebook post, which has since been deleted, FOX 28 reported. “Treated us like crap, refused to leave food for guests in the bathroom or chatting. They said when they are seated they will be served. They charged us over $12 a drink which we all paid. And then left this sign on the bar! This event was a post deployment ceremony! These men and women were being honored for serving our country, but I guess serving them at the double tree is too much! Just so you know, we did not damage the building and there was no reason to treat us this way!" I just read an article about Double Tree Hotel in Colorado Springs disrespecting military personnel. We went through this in the late 1960's in the airports, train stations and streets military personal are fighting over there so you don't have a war in your lobby like many countries have. Double Tree lost this customer there are a lot of places to stay that appreciate our business. You need to screen and train your workers and managers much better. I was on the elevator and hurd a unpleasant conversation in the next elevator very loud.What was said that the worker wasn't changing sheets.What was very unpleasant to hear that the manager is aware about the situation and nothing has been done. How is that safe for our health cross-contamination,uncleanness that's not acceptable.How long this been going on and nothing being done.As I walked to my car .Let me mind you the same manager and Employee is now outside smoking cigarettes on the side of the building.When I'm waiting on dry towels! !The towels in my room are damp also the sheets!! I went to the nearby Wal-Mart and bought me some towels.I really think someone need to look into this.Are you been polite to cover up the uncleanness?! Please can you help as I feel I have been misled and now don’t know where I stand with the hotel booking I have made? Last night I came across the George Michael tribute event planned at the Edinburgh Airport on the 15th February. With my wife being a huge fan of George Michael at it being the day after Valentine’s Day I thought it would be nice to come along. I seen the there was a 3 course dining option and that got me thinking about making it an overnight stay. Being a Hilton Honours member(HH#718199303) I went to your website and was hoping to find a overnight stay plus the event deal but when I couldn’t see anything I engaged in an online chat with a member of your team called Hunt. I asked if if there was an option to combine the event with an overnight stay and he assured me that this would be no problem and as a Hilton Honours member I would get the best possible deal. He provided me with a price which I was led to believe was a fully inclusive price for an overnight stay and 3 course meal tickets for the event. I provided my email address and asked if he could mail me the details so I could review the deal and make sure that it was what I was looking for, he told me this was not possible from the chat window, is this true? He then provided a direct link to the booking page on your website for the deal he had arranged for me. I could not see any mention of the tickets for the George Michael event and asked Hunt about this, he told me not to worry as he would put a note on my reservation to include them in my booking. With this in mind I went back an made the booking #3517817077. Again I went back to the chat thread and Hunt confirmed that he could see the reservation. Again I asked about the tickets for the event and again he told me not to worry but now he was telling me to contact the hotel direct, he supplied me with the phone number and they would sort me out, alarm bells start to ring now! I did remind him that he said that he would add a note to my reservation but now he tells me due to data protection he cannot access my reservation!!! I now ask Hunt to email the chat thread so I can use it for reference and he confirmed that I would receive a copy of the chat to my email address once I closed the chat. We exchanged pleasantries and bid each other a good evening. Unsurprisingly to me now I still await said email of our chat transcript. I have received my hotel confirmation and it has no mention of the George Michael event at all. I phoned the hotel direct last night and they confirmed that I have made a reservation for 1 night on the 15th February 2019 on a Dinner, Bed & Breakfast no mention or notes regarding the event. This reservation is of no use to me with out tickets to the event. The member of staff was very helpful and informed my that I could book the event tickets via another website but this is not what I was sold by Hunt on the chat thread, he assured me several times that it was all going to be included. It also transpires that my evening dinner is not the 3 course meal as described on the event page but a evening meal at the hotel of which I have no details of how this is formatted. I’m so confused now and have no idea where I stand or what I have been duped into booking. The whole process has taken what was supposed to be a fun overnight stay with a meal and entertainment by a tribute act of one of my wife’s favourite singers to me feeling very stupid and a bit angry mainly at myself for being rushed into the booking. Can you please help me sort this disaster out as the booking I have made and paid in full is useless without the George Michael tribute night! RACIST COMPANY!! I hope I never have to be humiliated by RACISM while staying at one of your hotels. Like the BLACK man from Portland had to encounter. Oh guess I wont have to worry. Cause I WILL NEVER give you any business. RACISTS!!!!! Making a black man who was a guest in your hotel leave for what appears to be only because he was black is wrong. Your employees should be fired. The police officer who responded to the call should also be fired. I am a retired white police officer and found the behavior of your employees and the police officer nothing less than a racially motivated act. I will never stay in another Hilton property. This behavior should have been done in the 1960s. I hope the man sues for millions. I would tell you this, if I were on the jury I would award him the maximum the law allows. Your support of prejudicial practice during the recent interaction between one of your employees and an African American man, a hotel guest, is indicative of a corporate attitude of exclusion and fear. This is the foundational attitude that is polarizing our country, negatively impacting gains in race relations, and degrading our humanity. I implore you to stand quietly, consider the insidious darkness and evil such action and the support of such action brings into our world. I expect to hear your personal disgust and outrage at the actions of a misguided employee and the hotel management at The Doubletree Portland who supported his action. Accept this opportunity to scrutinize your corporate culture. Become leaders of humanity, disavow the fear and hatred of our time, become known as a business that moves their employees toward the light and to their better selves. just read about the incident in Oregon, spend thousands of dollars a year with Hiliton, You just lost my business. I booked a room online and was guaranteed late arrival, I arrived at 11pm and was told that they sold my room since I was late. I am now stuck on the side of the roads because I do not have a room. I have been driving for over 3 hours trying to find a room tonight and all are booked. I drove over 8 hours to get here. On Nov. 15, 2017, I made a reservation for a seven night stay at a special convention rate at the Doubletree hotel in Virginia Beach, and guaranteed it with my credit card. Last week I decided to add another night, and unbeknownst to me, the agent converted the whole reservation over to a non-fundable, immediate payment rate. My credit card was maxed out because of the large unauthorized charge, which has placed my whole trip in jeopardy, as I had budgeted everything so that I would be able to pay the hotel bill at the END of the visit like normal (my travel buddy was to be responsible for half the cost). Hilton/Doubletree REFUSES to refund the money and told me that if I cancel it, I lose the reservation and cannot get the special convention rate I had originally booked. I am still attempting to get this resolved, with no positive result so far. We stayed on 9/23/17 at the DoubleTree by Hilton Hotel Pittsburgh- Green Tree ... 500 Mansfield Avenue, Pittsburgh, PA 15205. We had a awful experience! We went to our room walked in and it smelled like skunk so bad it made us sick. Went to the service desk and they put us in another room. That room smelled better, but due to construction going on we had to walk a long way to get there. My son found pills on the floor in that room we turned into the service desk. Went to give my son a great weekend and turned out a nightmare! When we checked out they said we would get a free night for our issues we had. Never heard anything so I called and they said a manager would call me back and never did! I would love to give Hilton a second chance, but would prefer it not to be this hotel! 1) arrived early and was told all was well with our reservation but that our room wasn't yet available. 3) despite the fact that my mother, who had booked the reservation, showed him her hotels.com confirmation and payment receipt he just kept shrugging and saying we didn't have a reservation. 4) eventually he went to his office to contact hotels.com. he returned 30 minutes later having NOT called hotels.com and having zero solution for us. We were not asked to sit down, offered water or coffee or in any way given any sort of hospitality or courtesy. 5) When we called hotels.com ourselves we were immediately told that we had a reservation. The rep from hotels.com spoke with the manager (Alberto Nogales) and emailed him a copy of our confirmation. At that point, we were checked in by the manager as he continuously kept telling us that he hadn't ever had the reservation. At no point did he express any sort of apology for the confusion. 6) When my mother asked him if there was any way he might like to compensate us for the almost 90 minutes spent trying to check in he behaved as if he was outraged, asking "it's my fault?!?". When I explained that while it wasn't his fault per se but certainly could have been handled better he agreed to comp our breakfast and upgrade us to a king size bed. (When we checked out our bill showed zero incidental or restaurant charges, however we've since been charged for the breakfast). 7) While we were checking in another couple was asking about the A/C in their room not working. The trainees at the desk all earnestly explained that it was only in a couple of rooms that the A/C was out and that it would be fixed very soon. 8) Upon arriving to our floor we suspected that the problem was more widespread and discoved that in our room the A/C didn't work.The thermostat was reading in the high 20s. We called down and were told it was a building-wide problem and would be fixed momentarily. 10) A mainanence person came upstairs and opened the window, no fan or water was delivered. The room remained in the high 20s for the remainder of our stay. 11) The following morning we again were told the problem was being fixed and would be resolved momentarily. 12) As I was leaving the hotel that morning I slipped on the ramp and fell down, injuring my hand and twisting my knee (it was raining and the ramp was without any type of slip protection or signage warning of slipping). My hand is currently fine but I was unable to use it for the day and was extremely restricted in my ability to walk around. This was the only day my husband and I had in London and it was more than a little disapointing. 13) When I went inside to let the manager know what had happened I was told he was in a meeting and was unavailable. I insisted and a member of the staff went to inform him. 15) He took an accident report and asked if I wanted him to call me a taxi to the hospital. I declined. 16) As I was leaving I saw one of the porters and let him know what had happened and requested that some type of sign be put out so that nobody else would get hurt. The porter said he would do what his manager told him to do. When I returned later that day to retrieve my luggage there was a small sign at the bottom of the ramp but nothing at the top of it. It was still wet. Over the course of my life I've been lucky enough to travel all over Europe, the Middle East, Central America, The United States and Asia. I've stayed in rooms from $10-$1000/night in more than 20 countries. I have never before felt the need to complain, chastise or in any way ask for compensation but I am doing so now. The staff at the Doubletree Hilton Hotel on Bayswater Road in London is BADLY in need of training or replacement and your guests are being treated intolerably badly there. If at any point anyone had offered us a glass of water, a cup of coffee, a place to sit, a word of sympathy or even just done their jobs and not lied I wouldn't be spending my time today writing to you. The room was paid for by my mother, Judy Bayer, through Hotels.com (she also travels extensively and is a Hiltons Honors member) the nights of September 3rd and the upcoming night of September 15th. At the very least she should be offered a full refund and if at all possible we would like to move our next reservation (9/15) to the Hilton at the Queensway station up the road. I called about a employee stealing supplies and credit cards from the job. I told the supervisor when it happened and the supervisor told me she would look into it that's been about 2 months ago. The supervisor I talked with ended up telling Ms. Kelly what was said.I made a report on her, cause if the hotel staff want do nothing about it I will myself. These pictures are stolen credit cards they just have her name on them and she smokes weed. My reservation was made for me as a guest of the Grand Lodge of Illinois Ancient Free and Accepted Masons. I received a reservation for Thursday, October 6 through Saturday October 8. I received an email from the hotel, and a link to a website to pick out my room. Every time I tried to use it, it gave me an error message that the system was not working properly and to come back later. I did that four time, with the same results. The front desk, when I arrived, gave me the key to room 913. That was OK, but not on a Hilton Honors floor. On Friday I attended the meeting where I spoke as a guest of the Masons, returned to Room 913, and notice there had been no housekeeping. While I was working on some papers, I was surprised by a man opening my door with a key. He told me 913 was his room, he had the key to prove it, and I needed to get out. I told him I did not order a roommate. He left. I called the front desk, and the person there told me I was not even registered in the hotel, and yes, they had given the room to someone else. Then this person switched me to someone else who told me I was supposed to have checked out that morning. Then I was asked to restate how long I intended to stay, which was until check-out on Saturday. Someone else tried to blame the problem on converting to new room keys, and sure enough, two guys knocked on my door and said they were there to calibrate my door lock. This was, by then, too much of a parade of people trying to get into this room. Then housekeeping showed up and said her list did not include the room because it was unoccupied. I went to the front desk to check out on Saturday and spoke with the woman who had originally checked me into the hotel on Thursday. She was apologized and said she did not understand what went wrong, and how some other clerk had given a key to my room to some man. She wanted to know what the hotel could do to make up for this. We settled on 30,000 Hilton Honors points, but she said her manager needed to approve. At this point, I have not heard from the manager about an apology or the points. I was hung up on by the Doubletree front desk attendant Taylor / Tyler after he badgered me about a repair that needed to be done on my door. Please allow me to explain: I checked in Friday August 12, 2016. My room was never cleaned, just the trash emptied on occasion. The toilet had /soda in the bowl, (Dr. Pepper) and on the seat. Which is a clear indication the toilet was never cleaned. I had to call to the front desk for toilet paper. I assumed this was part of the amenities that came with the room. I guess not! A bra I never wore was thrown in the shower.. The lock on my door was not working properly so my door was accessible to the public for 4 of the 5 days I was there as evidenced by a friend just walked in my room and woke me up for a meeting. My door was shut but it was not locked. Tell me how safe I felt. On the fifth day the General manger sent engineering to look at the door, the same engineering department Taylor/ Tyler said he was sending the day before. I had the tuck able sheets, this never happened when the bed was made. The front desk stated my sheets would be changed on Tuesday however the same pizza crumbs remained in the bed from the night before. Finally my door was fixed on Tuesday. in my room I had $1300 cash, my engagement ring valued at $5,000+ and a Movado watch my son bought me valued at $500+. I was told I should have used the safe. Well if the door would have locked that would have been enough security for me! I did not appreciate the lack of concern from the General manager or never being asked about compensating me for endangering me for the 4 of the 5 days I stayed there! if I wanted my room accessed by the public, it should have been my decision, not the hotels! I have stayed at this particular location at least 5 times and never have I been treated so poorly. I never complained as I felt like there may be some type of repercussion. The general manager was to casual about my concerns and I feel like someone should know about it therefore, I will be contacting the Doubletree corporate office, the Better Business Bureau and the Attorney Generals office as I don't feel I received what I paid for. Never should ones safety be compromised. I took the hotel representative Karen to my room to view said concerns about the cleanliness of my room. She witnessed all I speak of and contacted the General manger on his cell phone. Called housekeeping 3 times about something left in the room. No response called front desk 4th had a rude clerk who said it was lost. 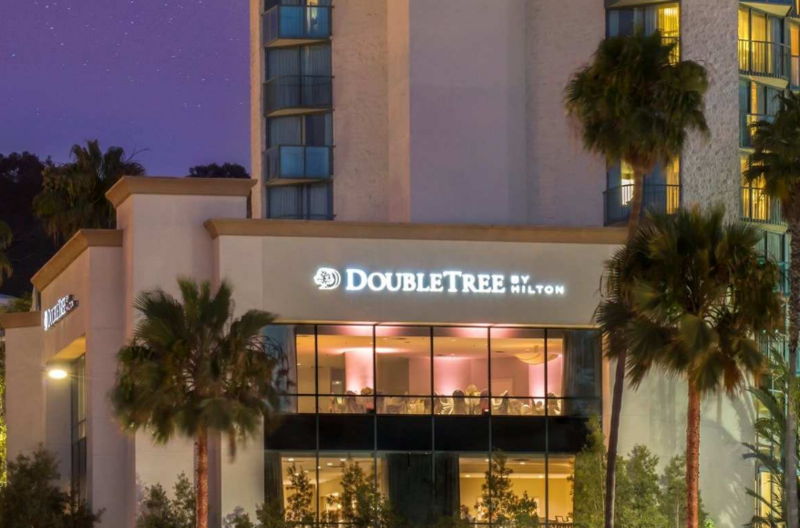 Make your vacation worth it by booking the best hotels through Doubletree. I have taken my family for a trip and booked the best possible hotel I could find on Doubletree. It gives you a choice of hotels with the rates attached to it. That's not all. They have pics and images of the hotel so that you can get a sneak peek to the hotel and know where you are getting into. I planned my stay in advance. Double tree has smarter stay with our Advance Purchase Rates. When you plan ahead and reserve in advance, you'll save up to 20% a night. Who does that. Great comfort, food and ambiance with the hotel that I booked though them. Amazing vacation and I sure know next time it is going to be Double Tree to plan my vacation or travel.